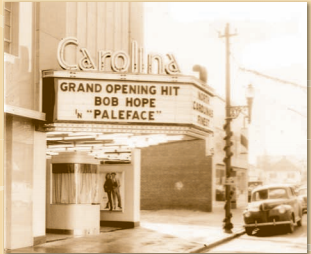 With a glittering marquee and Mirrophonic-Deluxe sound system, The Carolina Theatre opened in 1948 in downtown Lexington as the finest, most attractive and comfortable motion picture theater in the Carolinas. Everything modern and ultra-modern attainable went into the construction of the building and into the equipment. The debut showing of Paramount’s Technicolor production “Paleface,” starring Bob Hope and Jane Russell, was held on opening night. The theater was the hub of activity for Lexington. Saturday morning movies, sponsored by Coca-Cola, were attended by children using soda bottle caps for admission. Saturday nights were attended by adults and teenagers. The 11 pm late show was a popular outing. With the advent of cinemas during the seventies, the Carolina Theatre’s popularity declined and it eventually closed. It sat quietly for a few years waiting to be rescued. In 1976 a group of dedicated individuals, led by local businessman Edward “Eddie” C. Smith, raised funds and purchased the Carolina Theatre from ABC Southeastern Theaters. They then transferred ownership of the building to the City of Lexington. The building underwent a detailed restoration and reopened as the Lexington Civic Center in May 1980. In 1987 Eddie Smith purchased the neighboring building (Green Printing) and donated it to the City of Lexington. This building was united with the Civic Center adding a ballroom, dressing rooms and scene shop. Since then, several renovations have taken place throughout the building including new seats, a hydraulic orchestra pit, and updated lighting and sound systems. In 1995, during the Civic Center’s 15th anniversary celebration, the Lexington City Council formally renamed the facility the Edward C. Smith Civic Center of Lexington. Eddie Smith had worked as an usher at the Carolina Theatre and met his wife there, and he dedicated much of his life to the restoration and overall success of the Civic Center. In 1998, Smith led the “Set the Stage” campaign that raised the Civic Center to the professional level that it is today. 07/20/2018 @ 7:30 pm - 9:00 pm - Secret Life of Pets!